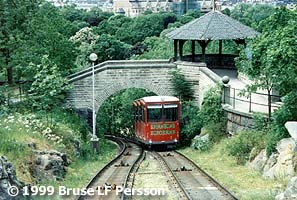 Sweden's first funicular railway was built for the great Stockholm Exhibition on Djurgården in 1897. 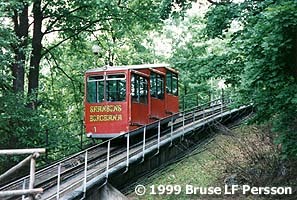 The Swiss firm Von Roll AG built the funicular on the northwest side of Skansenberget (Skansen Mountain). The railway was single-track with a passing siding; it had a rise of 30 meters and a total length of 107 meters, giving a grade varying from 25% to 34%. Service was provided by two green cars, each of which carried 16 persons. These were connected by a cable so that when one ascended, the other descended, so that the cars acted as counterweights. The trip took just over a minute and cost 15 öre. The railway was opened may the 15:th 1897, the same day the exhibition was opened. While the exhibition was going on during the summer of 1897, more than 20,000 passengers were carried in three weeks. The funicular was in daily operation until the 1940s; after that it was only operated in the summer. At the end of the 1950s, the railway ceased operation altogether, disappointing its many friends. But during the 1970s the railway was restored and slightly extended. About 75 years after the original railway was built, the Von Roll firm supplied the new equipment, using the most modern technology for construction, control and passenger comfort. After the restoration, the railway is now 196.4 meters long, with a total rise of 34.57 meters, giving a grade between 9.1% and 24.7%. Each of the two new cars can carry 45 persons, and are driven via a cable by a 135 hp DC motor, so that the cars travel at the breathtaking speed of 2.5 m/s, and the ride now takes 90 seconds. The newly restored Skansen Funicular was certified by the Swedish Railway Inspection Board on 17 April 1973, and looks certain to be running for next year's 100th anniversary! All pictures was taken in june 1996.